PYI Inc. offers its seafaring customers a dripless mechanical shaft seal that has become the world's top-selling mechanical seal. The PSS (Packless Sealing System) shaft seal has secured its place in the world's most reputable boat yards and boat builders' standard installation practice. Not only does the shaft seal keep the bilge dry with its 100-percent watertight seal, it also protects the propeller shaft from wear and tear. It can be used on all vessel types from ferries to jet skis, to work boats and coast guard crafts. It is backed by a three-year limited warranty, certified by ABS, BUREAU VERITAS and RINA, and is fully supported by the PYI Inc. customer service team. Propeller Depot carries the entire line of PYI packless dripless PSS marine shaft seals, and offers competitive pricing on all models. 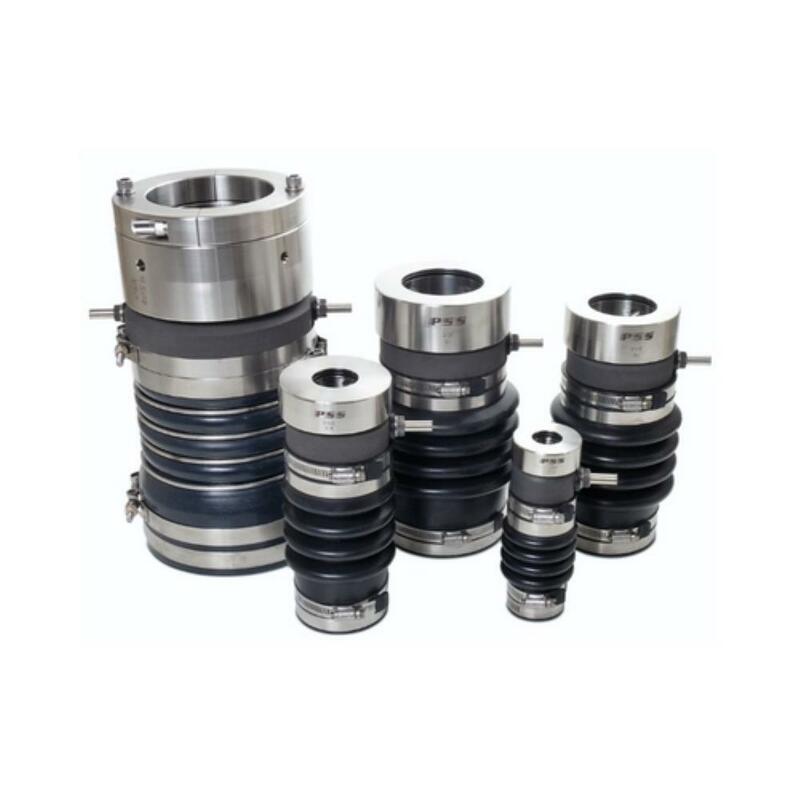 Those familiar with PYI's PSS shaft recognize its advantages as it removes the challenge of constantly making adjustments, maintenance, and the costs known to accompany average packing-type glands. Thanks to its primary materials of high-density carbon and high-grade stainless steel, the PSS shaft is less vulnerable to water-flow disturbance. It is melt-proof, will not fail dangerously, or degrade the propeller shaft over time, as is evident with many inferior sealing options. The PSS shaft seal can be easily installed and is suited to shaft sizes ranging from 3/4" to 6". It also has the added benefit of being able to fit shafts with minor pitting or wear from prior use. It can also make up for issues of misalignment and minor vibrations. PYI Inc. is known for its customer service and prompt response to customer input. The company listens, responds, and adjusts their product to suit the needs of their ever-expanding customer base. PYI's main goal is to set the bar for the quality of manufactured marine equipment, and the PSS shaft is a fine example of that. Any vessel, whether recreational, commercial, or industrial, can fall prey to the high costs associated with maintenance, adjustments, and propeller-shaft wear. For over 25 years, PYI Inc. has set the industry standard for dripless mechanical propeller shaft seals. The PSS shaft seal's high-quality carbon and stainless steel components function as a superior product that not only seals watertight, but also greatly prolongs the longevity of the vessel's propeller shaft. PYI is a manufacturer and distributor of high-end marine, yacht, ship, and boat supplies and equipment. They have been in business since 1981 and are based in Washington, U.S.A. Their business goal is to provide top notch, innovative marine equipment and products, along with an unsurpassed level of service, safety, and customer satisfaction. All their products pass strict quality assurance testing and are constantly being upgraded and advanced. Max-Prop Automatic Propellers - These low drag propellers range from 2, 3, 4, or 5 self feathering blades and are used for sailboats. PSS Shaft Seal Packless Sealing System - The PSS Shaft Seal is the #1 selling marine seal in the world and is standard equipment in almost every shipyard or ship builder on the planet. Seaview Radar And Satcom Mounting Solutions - PYI manufactures mounts for everything from boating cameras, radar, searchlights, etc. Mounts range from dual, aft, vertical, forward, arch mounts or wherever you may wish to place the desired unit. Antifouling Systems And Paint - These products protect your inlets, filters, valve seats and pipe works. Autopilot and Steering Systems - PYI has numerous steering systems available to make sure your boat stays on the desired course. Floor Anchor Solutions - PYI has designed and engineered solutions to secure your floorboards or lock hinged panels. R&D Marine Drivetrain Solutions - Drivetrain products are designed to protect engines and transmissions from vibrations and shock loads. They provide more power to the boat and reduce noise and vibration levels. PYI Inc. also produces rudder bearings, shaft retention collars, KIWI non-skid coatings, protective clamp jacket covers, and many other products. They are one of the most trusted names in the business and their products are used and enjoyed around the globe. Propeller Depot specializes in providing PSS shaft seals, and ships them around the world. Propeller Depot has some of the best pricing in the world on the entire line of PSS standard and metric marine shaft seals. Propeller Depot looks to continue to expand their PYI product offering outside of marine seals.